Many times I find myself looking at Monitoring->Deployments in the ConfigMgr 2012 admin console, and find deployments that should be removed. The “out of the box” process to remove deployments is to browse to the object being deployed (Package, Application, Setting, TS, etc. ), select the deployment, and then delete. This process requires a few more clicks than I would like to do, so I created a right-click tool that will allow you to delete the deployment from the Monitoring tab. (Adjust the path as appropriate to your ConfigMgr Admin Console installation path). #use this script to delete Deployments from the monitoring node. Now re-launch your ConfigMgr Admin console to use the new r-click->Delete Deployment feature. As you can see from the code, we have to take different actions based on the object type to delete. 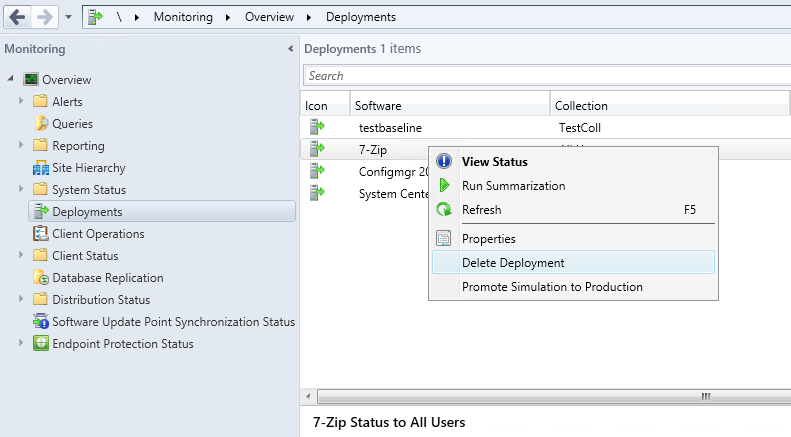 Remove-CMDeployment only removes Application deployments, while Get-CMDeployment returns all deployments. We use Get-CMDeployment to obtain vital information for each deployment, and then based on featuretype, perform the appropriate Delete method.